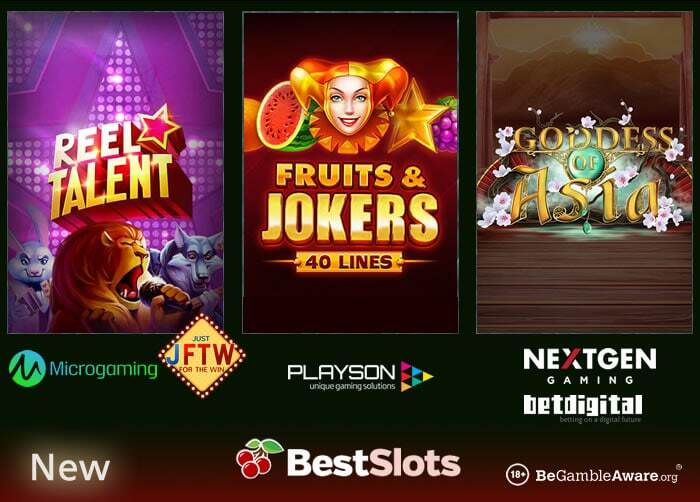 There are 3 more new slot games to try from betdigital/NextGen Gaming, Playson and Just For The Win/Microgaming – read about Goddess of Asia, Fruits & Jokers: 40 Lines and Reel Talent. Powered by betdigital and NextGen Gaming, Goddess of Asia is a 5 reel, 30 payline slot game with an Asian theme that can be played from 30p a spin across all devices. Visually beautiful and with an instrument-inspired soundtrack, look out for the Goddess of Asia wild as she will double your payout when part of a win. The game also comes with magic fans that give you multipliers and free respins with a wild reel. It also comes with a Free Spin Bonus feature where you can play with up to 15 free spins – the fan is an accumulator which the total number collected determining the multiplier applied to your winnings. There’s up to 6,000 times your stake to be won on each free spin! By the way, Goddess of Asia is exclusive, for now, at Mr Green Casino. Powered by Just For The Win and Microgaming, Reel Talent is a 5 reel, 20 payline slot game that can be played on all devices from 10p a spin. With an animal inspired talent show theme, there’s a Symbol Storage feature where winning symbols are stored with re-spins granted – when 3 symbols are stored on a spin, the Superspin feature comes into play. Here, you come across 3 different levels – the one you want is the Solo Performance Superspin level as it will display only the 1 stored symbol. You then get the chance to fill the reels with your chosen symbol for wins of over 605 times your total stake. Powered by Playson, Fruits & Jokers: 40 Lines is a 5 reel, 40 payline title which has a classic fruit machine feel. Playable from just 20p a spin on all devices, look out for the smiling female jester as she’s the wild and also the highest value symbol. It’s all about the golden star symbol as 5 across a payline will give you 400 times your total stake! For more new releases, head to our Slot Games section where you’ll find games from Blueprint Gaming, ELK Studios, Novomatic, Quickspin, Iron Dog Studio, Playtech, Yggdrasil Gaming and Net Entertainment – enjoy!